Begin your tour with an overnight in Alaska's largest city, Anchorage. The following day, journey from Anchorage to Talkeetna aboard luxury railcar. Spend 2 nights at the beautiful Mt. McKinley Princess Wilderness Lodge and explore the area. From Mt. 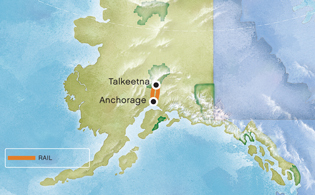 McKinley, re-board the Alaska Railroad route and return to Anchorage. Spend the night one last time in Anchorage before ending your tour the next day. We'll pick you up at the airport and transfer you to your Anchorage hotel. Overnight in this charming city nestled between Cook Inlet and the Chugach Mountains. For your enjoyment, enjoy an optional flightseeing tour or an activity spotlighting nearby "must-see" attractions like Portage Glacier. Overnight Anchorage hotel. Our luxury glass-domed railcars carry you along the historic Alaska Railroad as you travel to Talkeetna. On your journey, watch the scenery unfold before you. Talkeetna is an eclectic town at the junction of three rivers, where nature trails and optional activities abound. You’ll stay at the beautiful Mt. McKinley Princess Wilderness Lodge, featuring quite possibly the most awesome view of the "Great One" in the state. Once there, you’ll have time for optional activities such as flightseeing and float trips. Overnight Mt. McKinley Princess Wilderness Lodge. This morning, experience Mt. McKinley on an optional jet boat adventure or nature walk. The day is yours to enjoy at your leisure. Overnight Mt. McKinley Princess Wilderness Lodge. Enjoy a morning at leisure or choose an optional morning activity. Later, re-board our luxury domed railcars and begin the return journey to Anchorage. Enjoy one last night in Alaska's largest city. Overnight Anchorage hotel.